One of the most revered sections of narrow-gauge railroad ever operated in the United States was the Denver & Rio Grande Western's large network in southern Colorado and northern New Mexico. During the early 20th century the then Denver & Rio Grande began acquiring more powerful 2-8-2s for use on this trackage as traffic began to steadily increase. The first batch of Mikados to arrive were the Class K-27's, which became affectionately known as "Mudhens" by railroad employees. Over the years this class was rebuilt a handful of times and were finally slowly retired beginning in the 1930s as newer, more powerful 2-8-2s began supplanting the K-27's. Today, two survive in the United States and both are currently operational in Michigan and Colorado. By the early 1900s the Denver & Rio Grande operated an extensive network of narrow-gauge trackage running south and southwest of Denver. The D&RG had been built, entirely, as a narrow-gauge system and its dreams of linking to El Paso, and eventually Mexico, were cut short following a fight with the Atchison, Topeka & Santa Fe for use of Raton Pass in northern New Mexico. This led the railroad to new ownership and eventually a push westward towards Salt Lake City. The company's corporate history is a bit complex and far too detailed to discuss further here. However, through new construction and takeovers the D&RG had reached Salt Lake by 1883. Following bankruptcy it was renamed the Denver & Rio Grande Western Railroad in 1921 and further improvements and enhancements during the 1920s and 1930s saw a better route completed into Utah (such as the Moffat Tunnel). Over the years the Rio Grande had upgraded most of its narrow-gauge trackage to standard gauge. However, its lines west and south of Alamosa, Colorado were never upgraded, in part due to traffic losses following the mining industry's collapse during the late 19th century. In 1903 the D&RG acquired its first new narrow-gauge power for these branch lines in many years from the Baldwin Locomotive Works. The crews are said to have referred to them as "little monsters" since at the time it was the largest new power ever operated on that section of the railroad (previously 2-8-0s and 4-6-0s had done the job). Listed originally as Class 125 (the Class K-27 designation was used after 1924) the new 2-8-2 Mikados were built as Vauclain Compounds, then a relatively new type of design that carried high and lower pressure cylinders to more efficiently use steam. Unfortunately, the compounds were too complicated and expensive to maintain (others railroads experienced similar problems using compound steam) resulting in shop forces changing over all fifteen Mikes (numbered 450-464) to simple expansion (exhausted steam only once) between 1907 and 1909. The origin of their nickname as "Mudhens" has never been fully understood; one version of the story states the term came about because the Mikados were prone to derailments on the tight curves and poorly maintained narrow-gauge trackage. As they skipped and waddled along the ties the locomotive's looked like a hen, giving them their nickname. However, another version says that because of their low center of gravity and having their counterweights (or cranks) situated beyond the width of the rails (due to their outside frames) they appeared to weave and bob down the rough track giving them the name "Mudhen." Whatever the case, the Class K-27's had a mixed level of performance during their service lives. Aside from the derailment issues (which appears to have been mostly corrected after the original 40-pound rail was upgraded with 52-pound rail) the Mike's tended to lose steam caused by their shallow fireboxes with, as one former employee said, "little room up front between the grates and the arch. You had to be a good shot with the scoop. Too high and you'd hit the arch and the coal would fall in the middle, too low and the coal would land short of the front. Either way, you end up with a pile about two feet from the front, a pile that would extend from the grates all the way to the arch [and] with nothing burning against the flue sheet." Still, other former Rio Grande employees said the Mudhens were a joy to operate with responsive throttles and good traction (their tractive effort was rated at around 27,000 pounds). Several additional enhancements took place with the K-27's besides their conversion to simple expansion, all of which occurred during the 1920s. At this time most were upgraded with superheaters, larger tenders, and piston valves. That decade also witnessed the Rio Grande adding additional, and more powerful, 2-8-2s to the narrow-gauge fleet notably ten new Class K-28's from the American Locomotive Company in 1923 and ten new Class K-36's from Baldwin two years later in 1925. 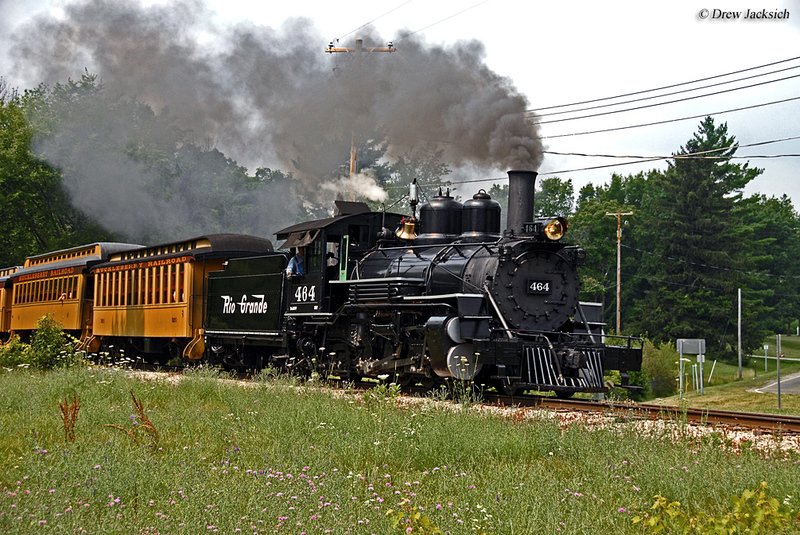 The railroad also reused boilers once belonging to its 2-8-0 Consolidations and with new frames from Baldwin built ten new 2-8-2s listing them as Class K-37's. Retirement for the Mudhens began in the late 1930s and all were either scrapped or sold by 1954, except one. In 1941 two were acquired by Ferrocarriles Nacionales de México (National de Mexico), Rio Grande #458 and #459. Also, country music singer and actor Gene Autry acquired #463 in 1955, which he later donated to the City of Antonito, Colorado in 1972. It was restored and returned to service on the Cumbres & Toltec Scenic in 1994, and then rebuilt again beginning in the fall of 2001. 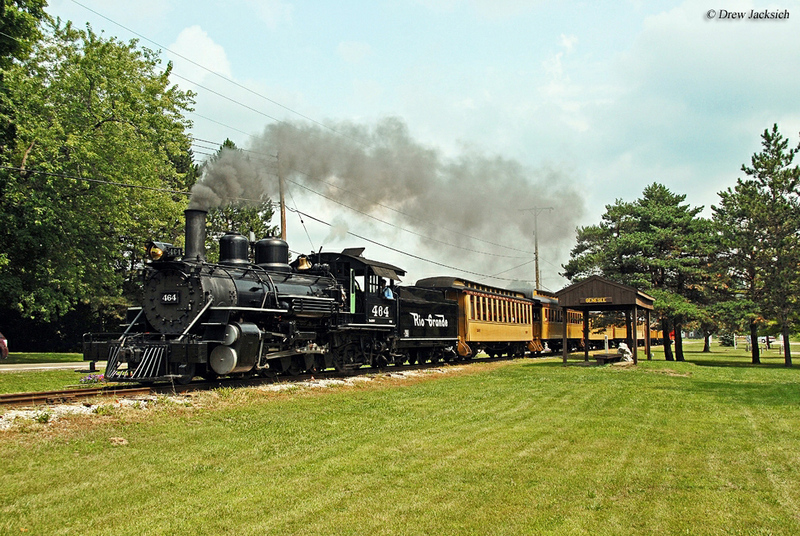 That restoration was completed and the locomotive is again operating as of May, 2013. Finally, #464 was the last to leave the Rio Grande, being retired in 1962. 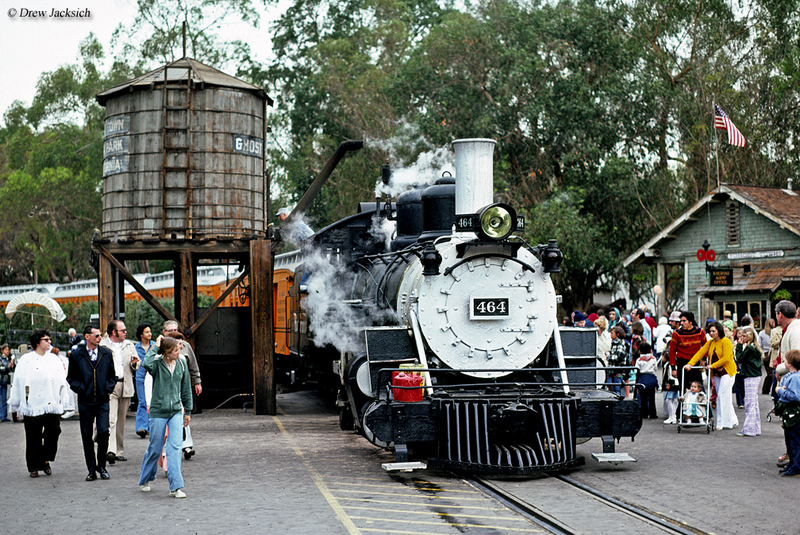 It was then acquired by the Knott's Berry Farm of California and then sent to the Huckleberry Railroad in Flint, Michigan where the Mikado still operates today. Home › Fallen Flags › Denver & Rio Grande Western › K-27 "Mudhens"